In the few weeks after the 2016 presidential election, individual investor bullish sentiment spiked to near 50%. Over the course of the next five months though, bullish sentiment trended lower to a year low of 23.85%. From March through April the market had some volatile periods that may have influenced investor sentiment; however, true to form this year, the market never experienced a prolonged or significant contraction. So, in spite of a fairly steady climb in the equity markets, individual investor equity sentiment remained at a level indicating investor cautiousness until November. 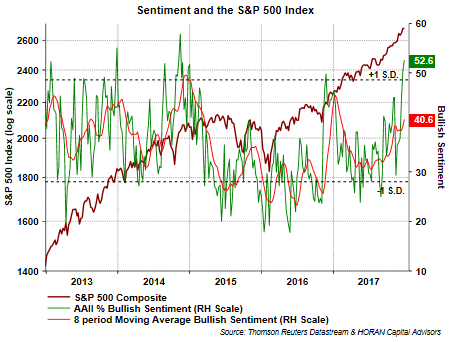 However, over the last month bullish sentiment has been on the rise and the American Association of Individual Investors reports bullish sentiment at 52.6% this week, the highest level since November of last year. 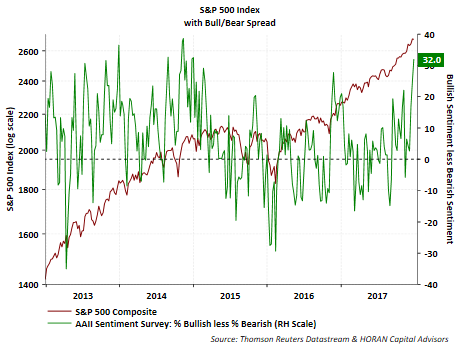 The bull/bear spread has also widen and is reported at 32 percentage points, the widest spread since early 2015. Investor sentiment is important to evaluate as individual investors tend to become the most bullish at market tops. Importantly though, sentiment is most predictive at extremes and at low levels, i.e, low level of investor bullishness. 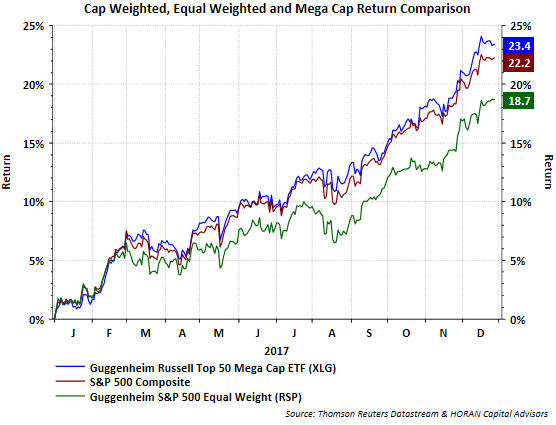 Recently, Urban Carmel wrote an article, What To Expect From Equities In 2018, that included a sentiment section highlighting market returns during bullish sentiment periods. High levels of bullishness still resulted in positive future returns, but returns were lower versus returns following low levels of bullishness.